Brothers and sisters, the ruthless Chinese regime is currently waging a war against Islam on the Muslims of East Turkestan. Its aim is to erase their Islamic beliefs and identity till not even a trace of it remains, and to force them to adopt its atheist beliefs through a brutal campaign of intimidation, incarceration, indoctrination, torture and even murder. For decades now, the Uyghur Muslims of East Turkestan have been subjected to a crusade against their Deen by the Chinese government, including bans on fasting, wearing of the Islamic dress, growing of beards; preventing Muslim children under 18 from entering mosques to listen to Islamic sermons; prohibiting Uyghur parents from giving their new born babies certain Islamic names, and providing their children an Islamic education or participating in Islamic activities. This is alongside pressuring Uighur Muslims into marrying non-Muslims from the Han Chinese population. Even giving the Islamic greeting of Salaam and choosing to eat Halal food have been labelled as extremist! Indeed, the hatred of this regime towards Islam is such that it has even forced Muslims to abandon Islamic burials and accept instead the Chinese tradition of cremation which the state is rapidly expanding in East Turkestan. Brothers and sisters, such is the extent of the Chinese regime’s fanaticism against Islam that in 2016, it launched its “Becoming Family Campaign” – a system where non-Muslim Han Chinese people temporarily move in with Muslim families in East Turkestan to surveil and report on signs that their hosts’ attachment to Islam maybe ‘extreme’. Such signs include refusing alcohol, praying Jumma, fasting in Ramadan, or even having pictures with Islamic texts on their walls. In 2017, Chinese authorities mobilized more than a million cadres to spend a week living in Uyghur Muslim homes for this purpose. And this January, Chinese officials announced that their government had passed a law to make a ‘Chinese’ version of Islam…i.e. to make Islam in line with socialism – an ideology based on the rejection of any God! La hawla wala quwatta illah billah. All this brothers and sisters, is alongside the operation of the Chinese Gulags in East Turkestan – that have been described by many as modern day concentration camps – where over a million Uyghur Muslims – men and women – have been incarcerated indefinitely by the Chinese government simply because of their Islamic beliefs. 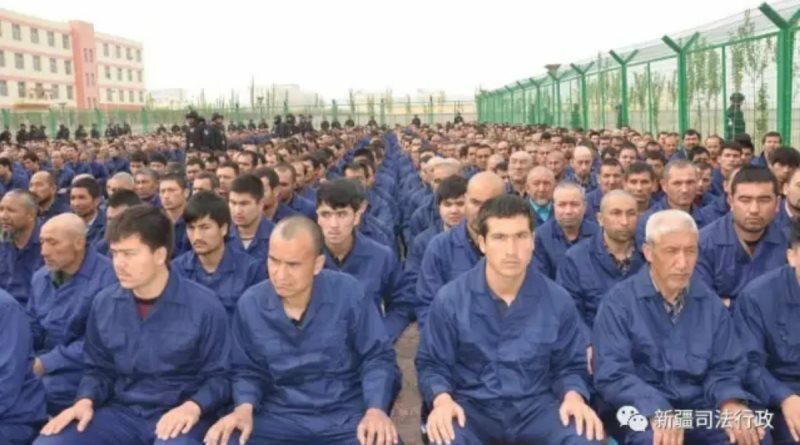 In these internment camps, our Uyghur Muslim brothers and sisters are being forced to renounce their Deen, drink alcohol and eat pork, as well as pledge allegiance to the atheist ruling Communist Party. Many of those imprisoned are being tortured or even killed. Furthermore, many of the children of those Muslims who are incarcerated or in exile due to the persecution have been placed in orphanages where they are being indoctrinated with communist culture to erase their Islamic beliefs, make them abandon their Deen, and mould them into enemies of Islam and enemies of their Muslim parents and families. The aim of the Chinese regime is to convert future generations of Uyghur Muslim children into its loyal subjects who embrace atheism, and Beijing’s vision of destroying the Uighur Muslim population and their Islamic identity. Hasbunallah wa ni’mal wakeel! Yet, despite this clear war against Islam being waged in East Turkestan by the Chinese state, and its campaign of ethnic cleansing against its Muslim Uyghur population, there has been a shameless but unsurprising silence from the regimes and rulers of the Muslim world to this brutal campaign. Indeed, even when the Chinese government compared Islam to an “ideological mental illness” and a “virus in the brain”…. (Astaghfirullah) it was not enough to invoke even a spark of genuine anger and response from these Muslim governments and leaders! China has bought their silence and submission with its huge investments in their lands, and tainted promises of multi-billion dollar agreements and trade opportunities through its Belt and Road Initiative. These sell-out self-serving rulers have repeatedly demonstrated to this Ummah their guiding principle in life – that financial gain will always take precedence over the suffering of Muslims and the sanctity of Islam. Indeed, when Imran Khan, Prime Minister of Pakistan, was asked in an interview about the persecution of the Uyghur Muslims by the Chinese state, he shamefully declared ignorance of the matter and described China as a “breath of fresh air” due to its investment in Pakistan! Astaghfirullah! Ministers from the Muslim world, such as Pakistan and Indonesia, have disgracefully described this ethnic cleansing of Uyghur Muslims as a –“domestic affair” for China – arguing that it has nothing to do with them… even though Allah (swt) says, وَإِنِ اسْتَنصَرُوكُمْ فِي الدِّينِ فَعَلَيْكُمُ النَّصْرُ “And if they seek help of you for the religion, then you must help” [Surah al-Anfaal 8:72]. So brothers and sisters, in this capitalism-dominated world, where financial gain will always top human suffering… who will protect the Muslims of East Turkestan? In this world, where we have Muslim rulers and governments who have placed their necks under the boots of the Chinese regime…who will stand against this war on Islam and defend our Deen? The Khilafah Rashidah is a state that will never allow financial gain to override its Islamic obligation of defending the Believers and the Deen; it will never stand silent while Muslims are being persecuted and our Deen attacked. Rather it will show in action rather than empty words the military, political and economic power of a state that is truly the guardian of the Ummah and Islam and sincerely represents their interests…such that China and any other government would not dare to harm a single Muslim or utter a single word that defiles our Deen.